A professional camera receiver like the EK 3241 is designed according to the Unislot or Sony standard, which ensures that the receiver pack will fit into the camera slots of HD cameras and has the correct connector pin assignment. The signals transmitted from the wireless microphone are directly fed into the camera and recorded in sync with the image. Thanks to their compact, lightweight design, camera receivers can also be carried in a sound bag together with a portable mixer and an audio recorder if required. This gives the sound engineer direct control of the audio signal, and he or she can mix and record several signals, or transmit the mixed broadcast signal to the receiver in the camera (camera hop), where it is recorded with the image onto the cameras memory card. What types of microphones can I use? Handheld transmitters and bodypack transmitters with lavalier microphones are the types most often used. If you would like to use a shotgun microphone or any other wired microphone use a plug-on transmitter to convert your wired mic to wireless. If the wired microphone you would like to use is a condenser model, you need to make sure that the plug-on transmitter provides the phantom power that this type of microphone requires. A very common application example is a wireless boom, where a shotgun microphone is combined with a plug-on transmitter. This ensures maximum freedom of movement for the boom operator, and he or she does not need to carry the additional weight of the cables otherwise needed. The audio is transmitted directly to the camera receiver which is mounted onto the camera or accommodated in the audio bag. What should I check before a shooting? Most important is the frequency your wireless microphone system is operating on. This means that you will first have to check the local licensing regulations regarding frequencies and output power to ensure that you are operating your system legally. On site, you need to check whether the frequency you have been assigned or would like to use is unoccupied. For this, switch on the receiver only, turn up its volume and listen via headphones. If the channel is free from any sounds and disturbance such as hissing noise, chirping and the like, this is an indication that this frequency is not in use. If you have been assigned a frequency band, it might additionally be useful to do a frequency scan with your receiver to get a more detailed picture of the spectrum environment you are operating in. A scan will help you to find free slots more quickly, and you will not have to try out frequency after frequency only to discover that you have landed somewhere in the middle of an occupied TV channel. If your shoot involves some distance between microphones and camera receivers, I would recommend a so-called walk test. While you are listening to the signal, have a colleague talk into the microphone and walk through the entire area that you need to cover. While reception may be excellent at a 10m distance, it might deteriorate considerably once you reach 50m, for example. In this respect, it is important to switch on all electronic devices which are going to be used during the shoot, i.e. cameras, LED lamps, etc. as these may interfere with the radio signal and decrease the transmission range. Another important point is the gain setting on the transmitter. If the level of the input signal is too high, the transmitter will be overloaded and will distort the sound; if the input level is too low, you will need to pull the speakers volume up and with it any unwanted background noise, resulting in very poor audio quality. To set the gain correctly, position and align the lavalier microphone properly, and ask the interviewee to speak with a normal tone of voice. Then set the transmitter gain such that the level is high enough and the transmitter does not indicate a peak warning once the voice becomes a bit louder. Only if the transmitter gain has been adjusted correctly can you set the levels of the subsequent audio chain, i.e. the receiver output level, the mixer gain or the camera input gain. What is meant by read after write? In the days of the analogue tape recorder, read after write meant listening to the audio signal which had only just been recorded. In such a tape machine, the play or reproduction head was positioned directly after the recording head, so you were able to check whether a recording was good while still recording. True read after write monitoring is no longer possible in the digital age. As described earlier, the sound engineer often mixes the various audio signals with the help of a sound bag and then wirelessly transmits the audio sum to the camera receiver. To still be able to monitor the quality of the audio recording, a trick is used: the headphone output of the camera is fed into an additional wireless transmitter, which is mounted (piggybacked) onto the camera. 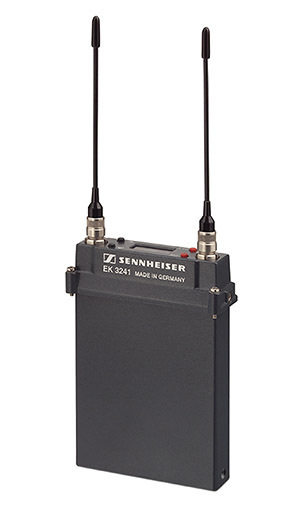 This transmitter sends the recorded audio to a bodypack receiver in the sound engineers bag, who can thus monitor the signal. What should I pay attention to when working with wireless mics and a sound bag? There are many natural enemies of a radio signal one of them is intermodulation. Intermodulation products occur with any non-linear transmitter, and can interfere with your signal. For example, when two transmitters are close to each other, the output signal of one will be picked up by the output stage of the other via the antenna. Then the transmitter will not only transmit your desired signal but also mixed frequencies, thus reducing the available spectrum and possibly interfering with another transmitter. This transmitter will produce chirping sounds or, in the case of a digital receiver, will have a greatly reduced range. It is not only transmitters that will disturb one another, the same is true for transmitters coming too close to receivers and even portable receivers being too close to one another. Therefore, you should make sure that you keep enough distance between the equipment in your sound bag, especially between the receivers and the transmitter which sends the mixed signal to the camera. If at all possible, the antennas of the units should not touch one another, also the housings should not touch as this will result in a greatly reduced range. If your bag contains a receiver for monitoring the signal, you should select a frequency block that is as far away as possible from the frequencies of your microphone links. A general rule of thumb is to establish a direct line of sight between receivers and transmitters. If the recording environment is difficult and a direct line of sight is impossible to achieve, you might consider using remote antennas to ensure reception or increase the range. There are portable antennas which the sound engineer can wear on the shoulder or the back, thus remaining fully mobile.